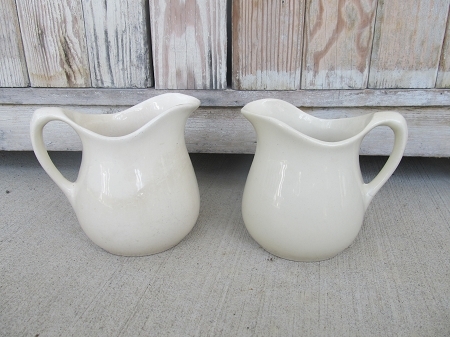 Antique Primitive Stoneware Ironstone Linen White Pitcher. Stoneware pieces such as these always attract me at Antique stores. I love them. Stoneware can be primitive, country, antique, vintage and farm house fresh. Fits all styles. This one is old and original. Has a shape like the old ironstone. Great shape. Old and original piece of stoneware. I have 2 that are practically identical. Size is 6" tall x 7" spout to handle. No chips or cracks. May have some glaze crazing from age, but gives it perfect patina.